The team of 'Masss' is stationed at Pearl City for the current schedule. We were surprised to see the entire team in Cleopatra theater. Venkat Prabhu, Suriya, stuntman Silva watched 'I' along with fans at Thoothukudi. Suriya refrained from photographs. His PRO requested us to stay away from him and give some privacy. Meanwhile, Venkat Prabhu was so friendly and just took photos with fans. 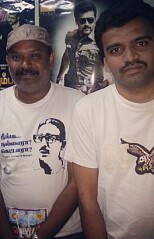 Myself and my sister Jemy took photo with him and enquired him about 'Masss' and he said movie is progressing well. After the movie ended, Suriya spoke with fans and signed autographs and left with a smile. The team is currently shooting some scenes in Nila Sea Foods (P) Ltd. This page has information about Masss team watches 'I' in Thoothukudi, Masss team watches I in Thoothukudi.